Are you looking to cut expenses for your small business or organization? You can save some cash by replacing those annual antivirus subscriptions with free equivalents. Though most free tools are restricted to home or personal use, a few are also available for businesses at no charge. We'll look at what the various freebies offer, and explain how to get started using them. Comodo Internet Security (CIS) provides a sturdy package for blocking viruses, spyware, rootkits, botnets, worms, and other malware. CIS goes beyond the basic malware protection that you get with a lot of freebies, offering a built-in firewall to guard against hackers and intrusions. Windows comes with a free native firewall, but using CIS's third-party alternative provides more-advanced configuration options. In addition its consistent interface is useful if different versions of Windows run on your network, since the native firewall differs from one Windows version to another. When we reviewed Comodo's free product in late 2010, we liked how well it blocked new malware, though we found that it had a few drawbacks in other respects. Still, it managed a an overall rating of 3.5 stars--a solid mark. The program's Defense+ feature analyzes and manages executable files to protect critical system files and to prevent malware from causing harm. It also has automatic sandbox functionality, which runs unknown files in an isolated environment so they can't do any damage if they turn out to contain malware. Comodo's SecureDNS service conducts malicious-website filtering to block phishing, malware-carrying sites, and other known dangerous websites before they can infect you. This DNS-based service is similar to OpenDNS, which we'll discuss later. 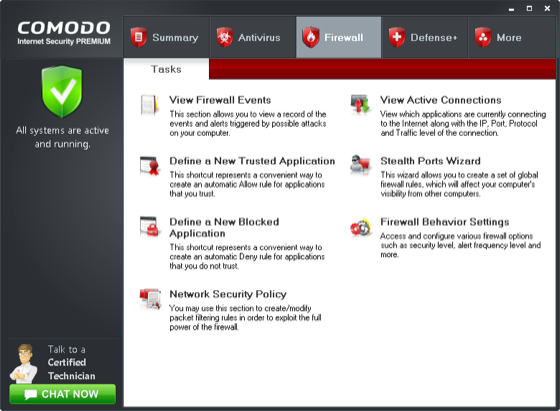 Unlike many free antivirus products, Comodo Internet Security (CIS) offers a firewall component. CIS lets you adjust an array of advanced settings governing heuristics levels and other general scanning settings, as well as customizable "scanning profiles." The Firewall and Defense+ features are highly customizable, too. 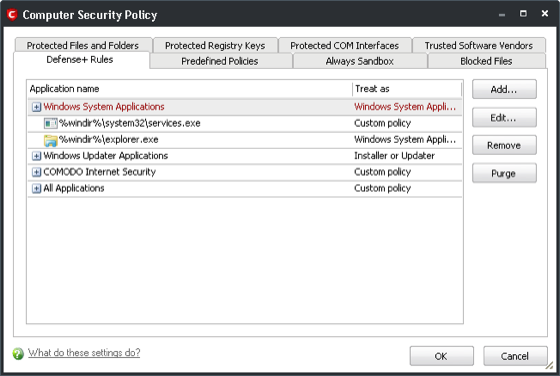 You can fine-tune the protection by using rules, policies, definitions of trusted files/networks, and other settings. Comodo Internet Security's Computer Security Policy manager. CIS's configuration management is very convenient for running on multiple PCs. Just configure one PC, export the configuration file, and import it to the others. All settings are backed up, including scanning profiles, security policies, and password protection. If you want to give CIS a try, download it from the Comodo site. Just prior to installing it, make sure that you have completely uninstalled any existing antivirus program and rebooted Windows to prevent any conflicts. You should also disable Windows Firewall if you choose to install Comodo Firewall when installing CIS. During the installation, the setup program will ask you whether you want to enable SecureDNS. If you plan on using OpenDNS (discussed later), don't enable SecureDNS. Once you've installed CIS, go through all of the screens and settings, and configure it to your liking. The default settings are best for most situations; for full protection, however, you may want to consider enabling cloud scanning and rootkit scanning in the Scanner Settings of the Antivirus component. Also, discover and configure the security policies settings of the Firewall and Defense+ components. 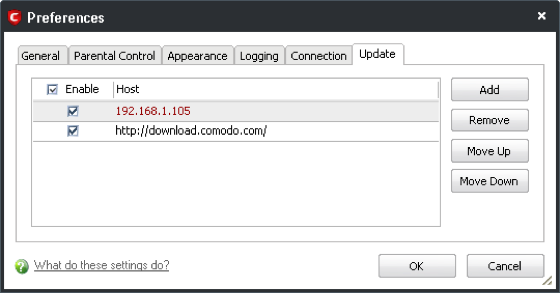 To reduce unnecessary Internet traffic when you use CIS on multiple PCs, install the Comodo Offline Updater (available at no charge from Comodo's site) to one PC, so that it can download Comodo's virus database updates. Then configure each of the other CIS installations on your network to check for updates from that PC instead of from the Comodo server. To change the update server that CIS checks, select the More tab, click Preferences, and select the Update tab. Then add to the list the IP address or host name of the PC that you installed the Comodo Offline Updater on. Consider keeping the Comodo server enabled but in the number two position, in case you encounter a problem with your PC. Changing the update server used to download virus signatures. You should also consider setting a password for CIS and locking down the configuration so that other users can't change any settings. To do this, open CIS, select the More tab, click Preferences, and select the Parental Control tab.